Air India's operations were severely affected on Tuesday with at least 16 flights, including five international services, being cancelled as over 16,000 staffers went on a flash strike across the country to protest delay in payment of salaries. Several other flights were delayed, many of them by over an hour, as the strike from 1230 hours spread in major metro cities with employees walking out of their offices and organising demonstrations to press for their demands. 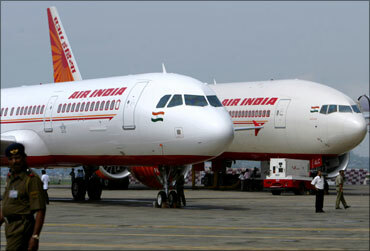 Air India had last week decided to delay the May salaries by a week. The international flights cancelled were those from Delhi to Jeddah, Abu Dhabi and Dubai (two flights) and one from Amritsar to London, Air India officials said. Domestic services from Kolkata, Mumbai, Hyderabad and Chennai were also affected. Among the flights delayed was one from Coimbatore to Chennai, which flew in Tamil Nadu Chief Minister M Karunanidhi after a two-hour delay. In Delhi, Civil Aviation Minister Praful Patel held a meeting with Air India CMD Arvind Jadhav to take stock of the situation, official sources said. They said the airline was planning to curtail operations from Wednesday primarily due to shortage of cabin crew and engineers. 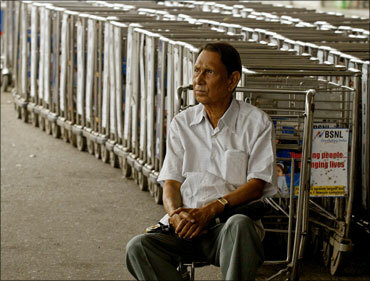 Many of the flights between major metros were combined on Tuesday in face of the agitation. In Delhi, the airline offered full refund to passengers travelling by flights that were cancelled while those in transit were given hotel accommodation and local transport. While senior officials said the management had invited leaders of the Air Corporation Employees Union (ACEU) for talks, its General Secretary J B Kadian told PTI on Tuesday evening that no such invitation has yet been received. Demanding immediate withdrawal of the 'gag order', he said the ground staff, cabin crew and engineers, mostly belonging to the erstwhile Indian Airlines, were participating in the strike. Kadian said no communication has also been received from the office of the chief labour commissioner. Besides the ACEU which claims representation of 12,000 members of the erstwhile Indian Airlines including ground-handling and technical staff and cabin crew, the All India Aircraft Engineers Association has also joined the strike. The ACEU had served a strike notice on the management and the chief labour commissioner on May 15 against Air India's decision to defer salary payments. However, that notice had called for a strike from May 31. 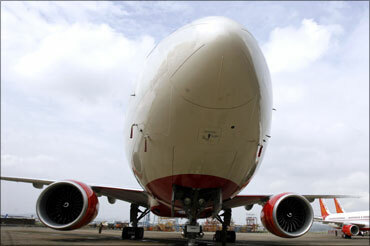 The unions belonging to the international wing of Air India have not gone on strike on the issue so far. In Mumbai, All India Cabin Crew Association general secretary Sanjay Lazar said in a statement that none of its members were participating in the agitation. He, however, demanded withdrawal of the 'gag order' saying it was violative of the Constitution. The Air India management appealed to the agitators to return to work at 'this hour of crisis' following Saturday's air crash that claimed 158 lives. Confirming cancellation and delays of several flights across different regions, an official statement said Air India was 'making every possible effort to maintain normalcy in operations'. 'The airline has been able to operate 116 of the 123 scheduled flights on the network till 1430 hours. While there have been four cancellations, some flights have been delayed or combined,' it said, adding that there had been dislocations at some non-metro airports. Maintaining it had mustered all available resources to minimise the impact on the scheduled operations, it extended 'unqualified apology to the passengers who have faced or may be facing inconveniences due to the dislocated operations'. The controversial circular, issued last evening, said 'instances have come to the notice (of the management) that contrary to instruction issued under office order HQ-81-3/360 July 2009, 13 employees of the company holding positions of office-bearers of unions/associations/guild are freely airing their views to the media despite channels of communication existing with the company to voice their grievances'. 'Employees concerned are advised to forthwith refrain from going public with their statements that has potential to harm the company's image and revenue prospects, failing which action as deemed appropriate will be taken,' it said. Reports from Chennai, Bhubaneshwar and other places said the delays and cancellations of flights left hundreds of passengers stranded.